Since 1986, Sea Pointe Construction has been offering our clients the ability to truly customize their home with custom cabinets. Not only do we have a custom caDesignbinet shop in our Irvine showroom and warehouse, but we work very closely with custom cabinet manufacturers in order to provide the best products with trusted warranties for our clients. When deciding which cabinets will be best for your home there are three options: Stock cabinetry, semi-custom cabinetry and custom cabinetry. These days there are many products that offer great value at a reasonable price; however, when it comes to cabinetry, you truly get what you pay for. For example, stock cabinetry may seem like affordable pricing, but you must consider that most stock cabinets are being made overseas at a much lower quality with limited warranties. If you are looking for specific sizes, styles or colors, stock cabinets are going to be a tough find. Be aware, that many times stock cabinets are also RTA, meaning ready-to-assemble. Semi-custom cabinets, on the other hand, can offer a quality product with great value. There are expanded cabinet finish choices and door styles with size modification flexibility. At Sea Pointe Construction we have committed to manufacturers that make products in the United States that can offer catalyzed conversion varnish and lifetime warranties. Catalyzed conversion varnish is an oil-based cabinetry finish that resists moisture and damage from most household products. However, due to environmental laws in California, any cabinets produced within the state must be water-based and will show wear and tear as time goes on. 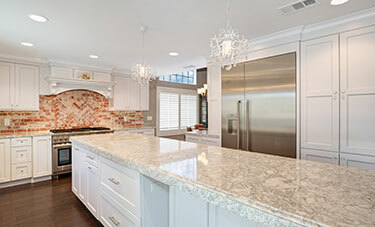 For those looking for fully customizable cabinets, Sea Pointe Construction has a custom cabinet shop in our Irvine showroom and warehouse, in addition to working with our preferred custom cabinet manufacturers. Many homeowners believe that to have custom cabinets, they need to be built in their garage by a woodworking carpenter. This is entirely not true. Sea Pointe works very closely with our custom cabinet manufacturer to create very detailed pieces with exact measurements that will work in any specialized situation. To continue offering our clients great value for quality products, we can also design a space using mostly semi-custom cabinets with a few pieces from our custom line to get the most out of your kitchen and or bathroom in just the look and style you like. The semi-custom line will match finishes and door styles to create seamless custom cabinetry look keeping cost in mind. The difference in price comes down to how well the cabinetry is built, the materials used and the available options for size, style, and finish. How a cabinet is built and what materials are used to build it are the two most important factors when deciding on a product. Are the drawers dovetailed? Is the cabinet materials particleboard, plywood, or solid wood? How thick is the wood being used? The thicker the wood, the stronger the cabinet construction will be. Are the doors and drawers on soft-close hinges and guides? These are all factors to take into consideration when choosing which cabinets will be durable enough for you and your family.